At 10:00 am today the morning light was not strong enough to work without the studio lamp. It is heavily overcast and last I checked there is a wee bit of snow expected. 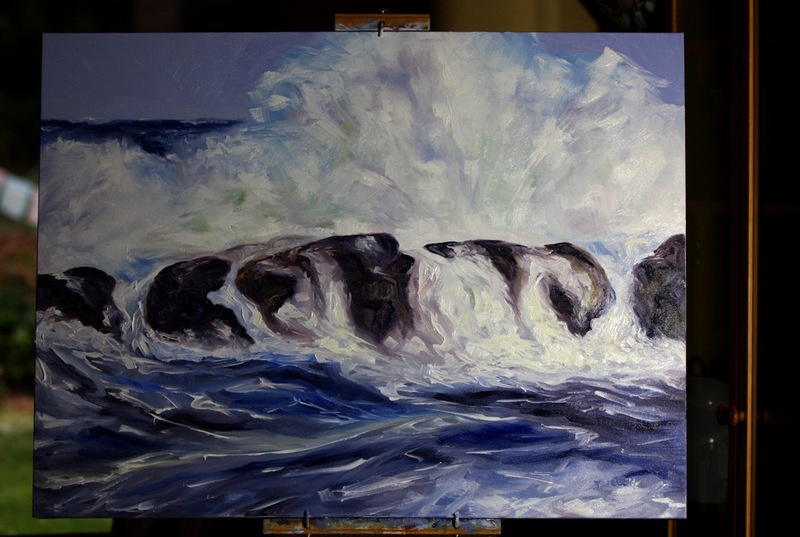 However, I was able to put the finishing brushstrokes on this large 30 x 40 inch oil on canvas painting this morning. It may be weeks before I can get a decent photograph of it so we will take a look now at the shiny-wet resting point of STORM WATCHING. 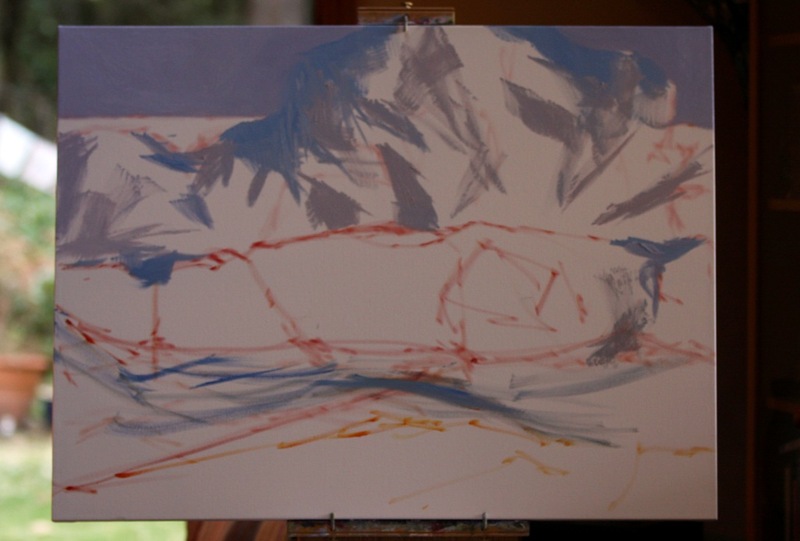 We may think that this painting began with this quick painting sketch on the canvas. But we would be wrong. It all started on Friday December 6, 2013 at about this same time of day when the power went out. I was surprised as there was little wind at la casa de inspiracion. But then the email notifications started coming in with Ferry boat cancellation and they were for the Inside Passage which is not common at all. So I knew then that there had to be wind somewhere and took a guess that it was on the east side of the island. Sure enough it was blowing a bit out there. But this isn’t the spot we need to be. 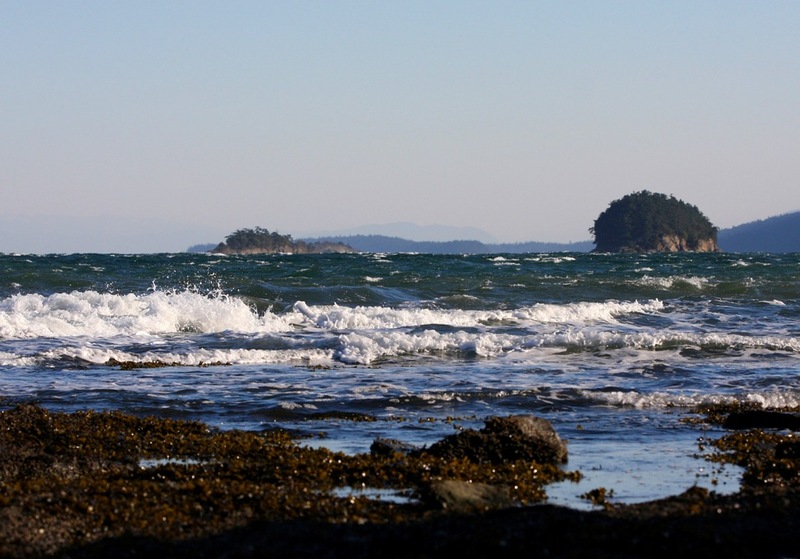 We have to walk out to Campbell Point in the Gulf Island Park Reserve because the waves are break on the rocks in a big way. Let’s go and have a look. Dress warm and still expect to the wind to go right into a person’s bones and starts sawing away with an ice-cube. (Detailed view and quality prints available HERE.) 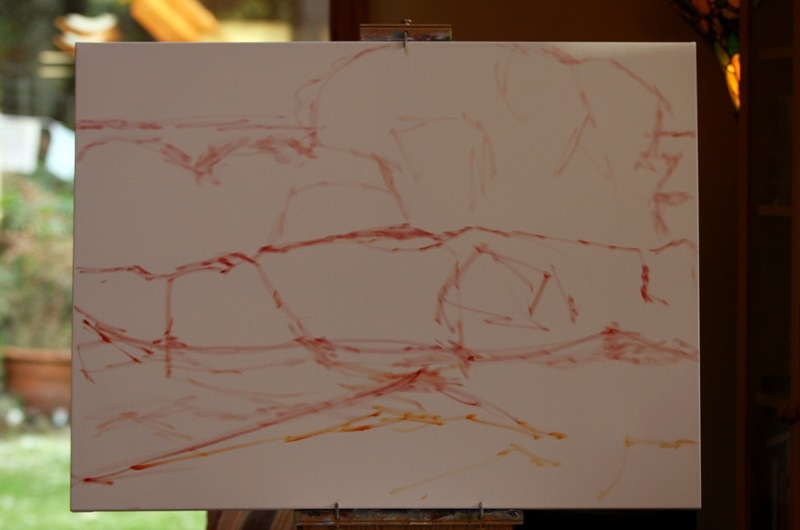 Sunday as in yesterday I pulled out the large canvas and placed it on the easel. I wanted the immediacy of this moment while it was still fresh to me on a cellular level. 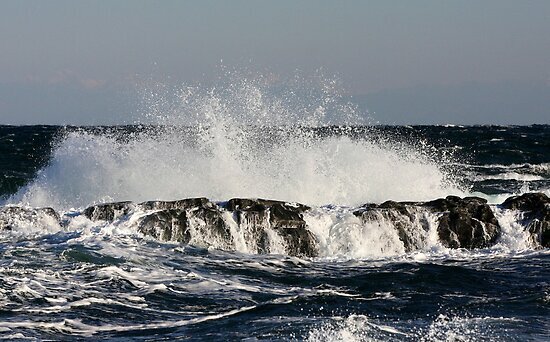 The continuous motion of the winds and the sea stir sea-spray high up onto the cliffs above. I want that. I want that feeling of stirring and motion. I decided no underpainting so that spray would have the advantage of the white underneath. I had noticed the spray shadow in one of my reference images and took advantage of this to create additional depth. I worked on getting the painting down with as few brushstrokes as possible. I want us to be slightly queasy from it as we are swayed in the waters and crash against the rocks within our viewing of this painting. At the core there is a knowing and a thimble-size of silence which makes it bearable. This too shall pass. This is the stage that the painting rested overnight. This is where I started earlier this morning and finished at the first photograph which will not be its final of course. For this we must wait for better light. UPDATE OCTOBER 13, 2014: Link to detailed viewing of the completed painting with purchase information and a link a short (less than six minutes) video where I talk about this painting can be found on the Terrill Welch Artist website HERE. In conclusion, my Monday morning blessing is patience, admiration and determination. If we are willing to try we can most often do more than we believe we can. 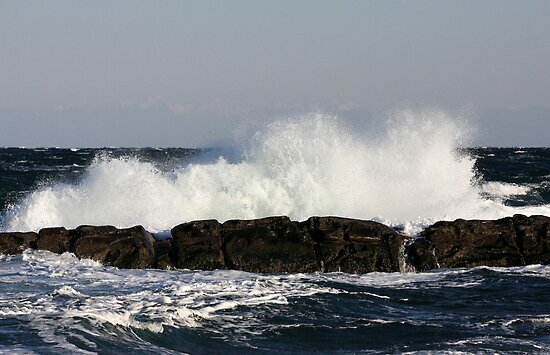 A large wave from a large canvas as you forge through the week ahead. What are you determined to accomplish this week even if the winds of doubt are fierce? Liberal usage granted with written permission. A timely question for me. The winds of doubt are so fierce today that I don’t even know what I want to accomplish this week much less muster up the determination to do it. Hopefully those winds will die down soon! Love the way your piece is coming along, btw. I can feel the cold wetness of that place! I love it when you take us on a virtual tour — even the ones where we need a slicker, wellies, and a Souwester rain hat! The shot with Mount Baker in the background is beyond amazing! What a description of the cold, Terrill! Sawing away at one’s bones with an ice cube. Brrrr… it’s that cold outside here. However, must start out and check the mail soon. Perhaps a cup of tea before that? Thank you for sharing your artwork, and the process behind it. A cup of tea sounds like a great idea Kathy. I have just made some chocolate chip cookies to be taste-tested along side. It has warmed up here today but is still heavily overcast. I must get out for a long walk regardless though. Terrill, I get such a kick out of walking through a painting with you! It’s like being in on a birth of a new being. I can echo Laurie and Kathy both, yes, it’s cold and wet, and yes, the ice cube remark brought a shiver down my spine! 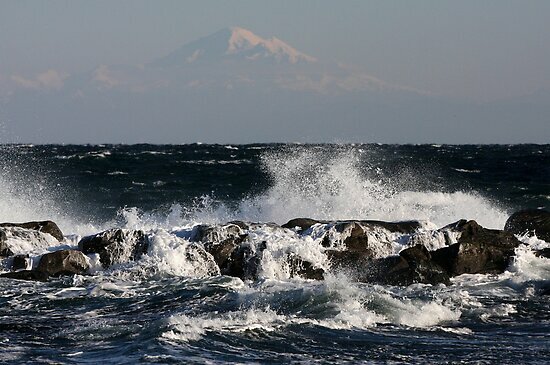 Mount Baker in the background is a superb composition, remarkable image. The idea of shooting to frame Mount Baker in the background Sandi was a bit of an after thought but I am now deeply glad the idea flashed into my consciousness before I got too cold to execute the shot. 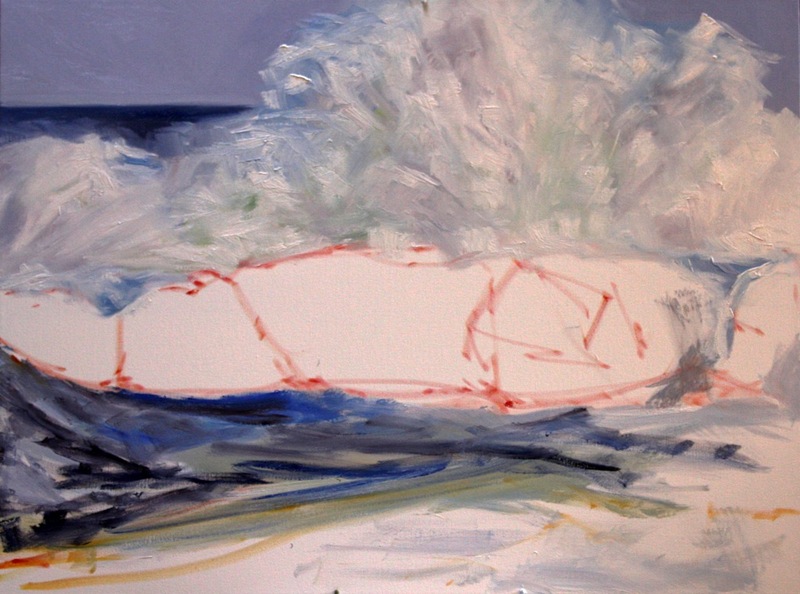 It is fun for me too when I look back and see how a painting has unfolded itself onto a canvas. Because I work mostly wet-on-wet the painting happens reasonably quickly so these photographic records are like reviewing the process in slow motion. What a great tour and guide through the process. 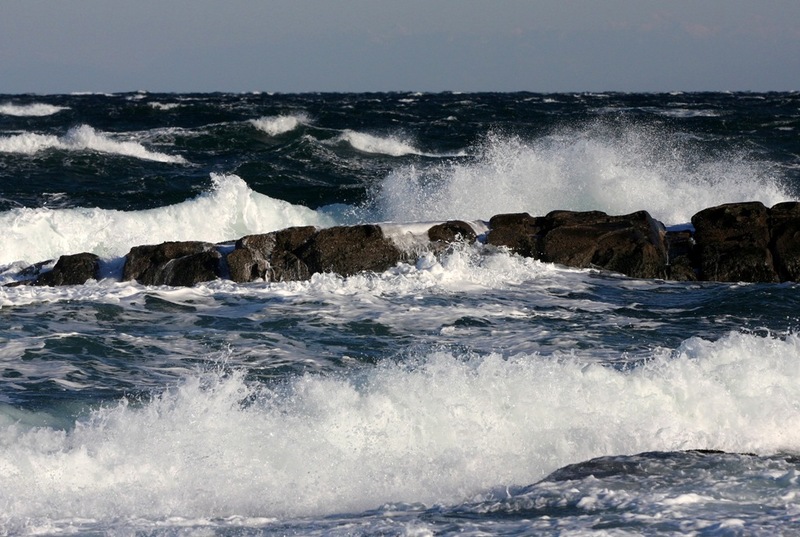 I very much like the colors in this one and you truly captured the windy sea. We had snow and not so much wind, now warming up a bit with rain. Yes ice cubes to the bone – that is an apt description. Ah you are most welcome Patricia. I was thinking about you on the day I was out photographing the storm as the winds seem to be coming from over your way but you must have missed the worst of it. I enjoy watching paint and canvas transform into a powerful image. I was determined to bite the bullet with this weekend’s impending snowfall (which did materialize!) and brave the weather to move forward with our plans. We did succeed. Ha! 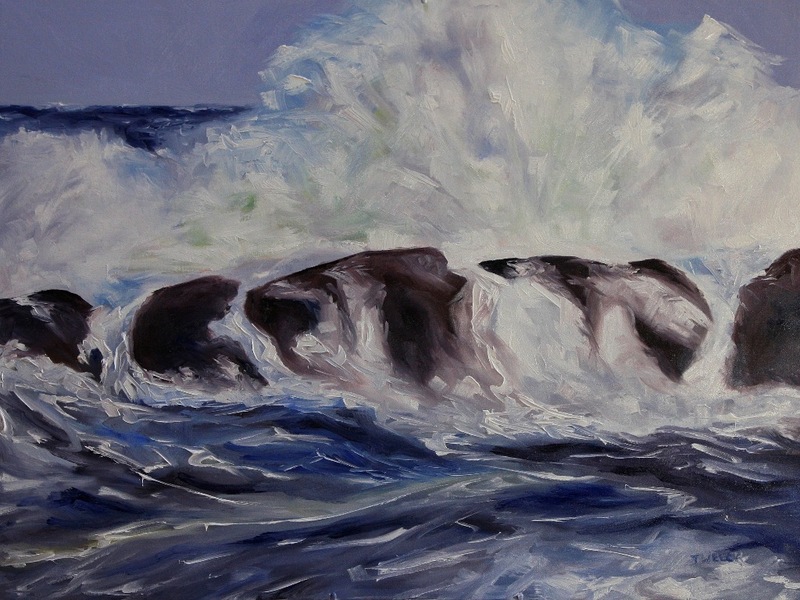 So much energy and movement in those vigorous storm photos and paintings! Good for you Sam! There is something so refreshing about coming in from time outside in crisp cool weather. Though one does not want to be getting frost bite or anything, with the right clothes it is definitely worth the adventure.